The EU have given Spain an effective veto over Gibrlatar's future as part of its Brexit negotiating manual. The President of the EU Council (not to be confused with any of the other six EU presidents), Donald Tusk, has unveiled a document detailing how the EU will manage its negotiations with the UK. In that document it proposes that every decision relating to Gibraltar is put in front of Spain. 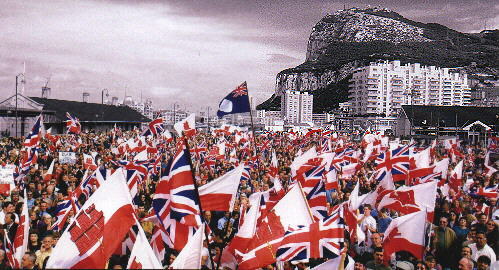 The EU has long supported Spain's illegitimate claim to Gibraltar which it ceded to the UK in the 1713 Treaty of Utrecht. Spain has been given extensive rights to set and police environmental policy for Gibraltar's waters and relentless breaches of agreements on border controls and illegal incursions by Spanish ships into Gibraltar's waters have been ignored by the EU. When Spain decided to hold up traffic at the Gibraltar-Spain border in 2014 in the height of summer on a whim the EU arranged an appointment for inspectors to go and see what was happening so the Spanish government could cease their operations before they arrived. Despite TV news footage being broadcast live around the world showing what was happening the EU refused to act. Former cabinet minister Michael Howard suggested that Theresa May would be prepared to go to war with Spain over Gibraltar as Margaret Thatcher did with Argentina over the Falklands. But a more diplomatic solution could be pursued by addressing the status of the Spanish exclaves of Cueta and Melilla on the north coast of Africa in our negotiations on behalf of our old allies, Morocco. It's only fair, right?